Our last night in Costa Rica was a sleepover. We took our mattresses and made a mega bed to take a glorified nap (of 1 1/2 hours). Wake up call was at 4:30, and we drove straight to the airport. We said a final goodbye to our driver Christian, another tough farewell. We ate breakfast at smashburger (because 6:45 is never too early for a good old fashioned burger, right?) 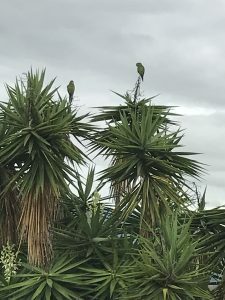 and flew from San Jose to Houston, Texas. 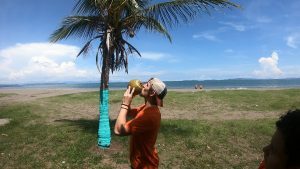 We said we wanted the trip to be longer, and wished we didn’t have to leave Costa Rica. God heard us, but instead of Costa, it was the Houston airport. 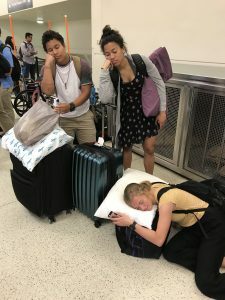 We waited for hours and hours for what should have been our 2:00 flight. When 6:00 came around, we could finally board the plane, only to wait yet another hour. Our flight finally departed at 7, and landed around 9:15 in Chicago. Then, it was onto the Hope bus we went, for our arrival home. This trip has been an absolutely amazing experience. We have all become so much closer than we even thought was possible. We’ve taken risks and stepped out of our comfort zones. We all have grown in some way whether it be spiritually or just as a person. We are beyond thankful that we were given this opportunity to serve God through serving others and we want to thank everyone who helped support us along our journey! After a late night of playing golf, spoons, & chugging aggressive amounts of water together, we woke up bright and early at 6:30 to head to a new school on the west coast of the country. 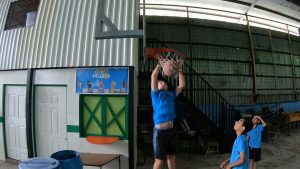 We began our hour and a half drive with high spirits and arrived at the school in Puntarenas ready to ball out with the kiddos! We had 2 groups of about 40 kids each of various ages. We rotated through 3 stations: an obstacle course, dodgeball, & Manos y Cabezas (Catch it or Head it). After yesterday’s long and tiresome day, today seemed like a breeze! We installed a couple water filters for the school’s kitchen and loaded onto the bus for the beach. We ate a empanada lunch with a spectacular view of the Pacific Ocean and multiple palm trees. 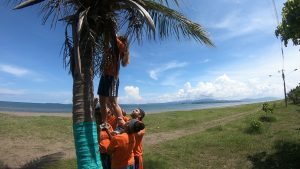 Using Hannah’s incredible cheer team skills, we plucked a coconut right off a tree and drank the milk straight out of it! We then took a dive into the ocean which was warm & wonderful for an afternoon swim. 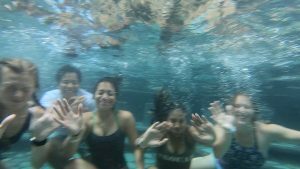 After many body surfing attempts, we had a highly unsynchronized synchronized swim session led by the highly uncoordinated Amie. Although Christian was not our driver today, we were allowed to climb on top of the bus for a sweet picture! 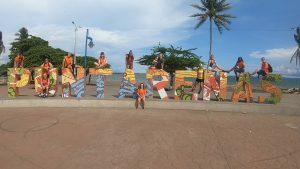 Following our short photo shoot, we took a quick walk along the shore to dry off. We left the beach covered in salt & sand and headed back to San Jose. 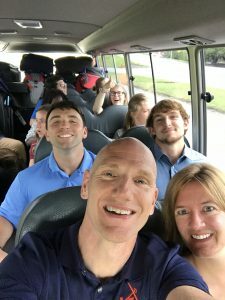 We ran into a bit of traffic and rain, so we spent about 3 hours talking and laughing together on the bus. After showering back at AMCA, we had another exquisite meal followed by our sad goodbyes to Nati & Patri. We ended our night with one final devotional full of reflections and words of encouragement for each other as we prepare to return to the USA. We are sad to be leaving this place of growth & passion for God’s good work, but we look forward to bringing back the things we’ve learned & also a ton of coffee. We plan on spending our last night together bonding, playing cards, and packing before our 4:30 wake-up call. Creative games with limited space. …and Luke drinks from it. After a lovely 5:30 wake-up call, we enjoyed breakfast before heading out to today’s sports clinic at 6:30. We arrived at 7 at the school and jumped right in. Everyone but Hannah, Kayla, and Noelle took part in today’s testimonies. 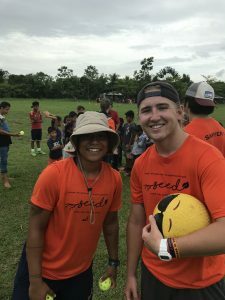 Technically we had four different sessions, but it seemed like every hour the kids would have another recess so we really got to hang out and bond better with them; the in between clinic free-for-alls were chaos. Balls could be seen flying in the air from everywhere. It is amazing how energetic kids are. It’s also worth noting that kids today still take part in eating bubbles—in case you’re wondering. Today was by far one of our longest days. We spent 7 hours with the kids. From there, we got ice cream. After that, we set out for the market. Not to ruin any surprises, but there’s a solid possibility that we might be bringing some things back. It was different bargaining with venders and having a choice in our prices. Again, we can’t stress enough that we might be bringing stuff back. We departed from the market to AMCA where we enjoyed another meal with no rice or beans—pretty neat huh? Tonight was concluded with a devotional focused around the Third Commandment. It was certainly thought provoking with many unanswered questions. Arika and Kayla join the dancing. Notable Quote: “¡Qué freakin’ bueno!” -everyone, all day long because today freakin’ rocked. Today we got to sleep in until 8 before walking to a bakery to shove our faces full of donuts & calzones for breakfast. From there we went to a nearby church and luckily had a translator for the entire service! It was comforting to understand everything for once! The service lasted about two hours and it was absolutely moving to soak in the Costa Rican culture in a church setting. At the end of the service, we sang the song Oceans in both English and Spanish which was an incredibly unique experience. Post-church, we hopped back in our trusty bus & headed towards the Canopy tour. Since we were crunched for time, we stopped at a local Pizza Hut for lunch & chowed down on the bus. 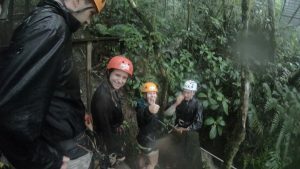 After some wild curves & rainy roads, we made it to the Canopy tour with barely 5 minutes to spare. We quickly changed out of our church clothes and got harnessed up for the tour! No one knew what to expect going into the tour, but it was by far one of the coolest experiences of our lives. 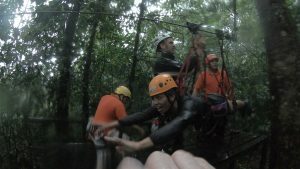 Although it was pouring down rain and thundering, we embraced the rainforest weather while flying through the trees like Tarzan! Halfway through the tour there was a giant swing that launched us over the trees. 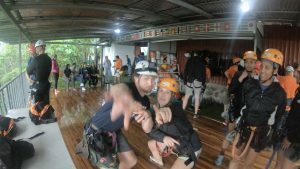 For the last zip line we switched into harnesses that allowed us to lay on our stomachs and fly over the rain forest and the rivers below. The views and experience are something that the pictures and videos we took will never do justice and that will last a lifetime. After the tour, we had a two hour bus ride back to AMCA in our drenched shoes and clothes. 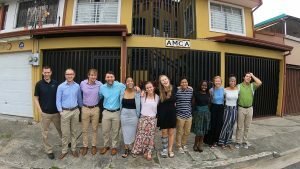 We finished the day strong with some pasta, bread, cinnamon rolls, and passion fruit juice back at AMCA before out nightly team time and Bible study. We are now starting to prepare our bodies for a long day of sports clinics at a nearby school tomorrow beginning at the best hour of the day: 5:30 am. Overall it has been a relaxing and enjoyable weekend filled with lots of laughter & adventure! Ready for church. In front of AMCA where we spent most of our nights. 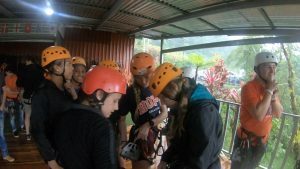 Getting ready for the zip lines. We began day five with an early wake up call at 6:45. Everything was still wet outside due to the downpour last night. 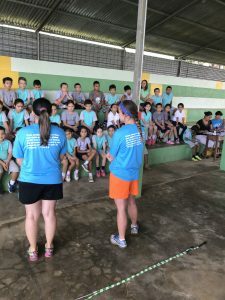 We said thank you and goodbye to Doña Rosa for her amazing hospitality in Platanar. 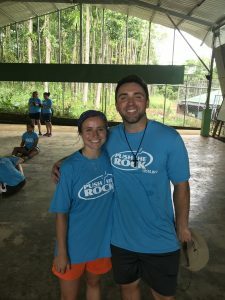 One thing that she said, despite her broken English, that will stick with us forever is, “Christians are the happiest people.” Once our driver, Christian, arrived, we loaded up the bus to go to the canopy tour. We had breakfast there, but realized that there were scheduling issues with our reservations. We plan on going back tomorrow. Right from breakfast, we headed to the Baldi hot springs. The hot springs were something you would see in a magazine. 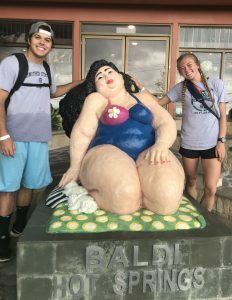 It was something we will never forget, and was the perfect place to “refill our bucket.” The water felt like a huge hot tub with waterfalls and water slides. It could be said that “the water slides would be illegal in the United States” -anonymous. The buffet for lunch was the closest thing to American food we have had in 5 days (it was delicious, but there was still no pizza or ice cream!) we stayed there for a couple hours after lunch, before we began the long trek to the AMCA house in San Jose. On the 3 1/2 hour ride back home, we spent time really growing together as a team. Pushing people out of their comfort zones, and breaking down walls. We had a lot of laughs and made a lot of jokes, but we weren’t afraid to ask the hard questions. 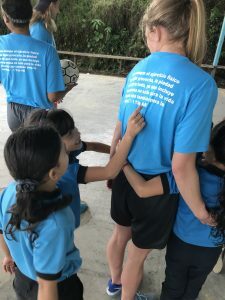 Reflecting on it now, all of us could say that the main purpose of this trip was to serve the people of Costa Rica, but this trip has also taught us more about ourselves and each other than we initially expected. To end the night, we had a late dinner and devotional that focused on the 1st commandment. 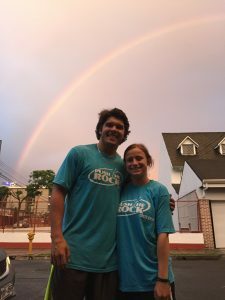 Nick and Nicole…and the goddess of the volcano? Nick is officially a dog dad now. And there’s a good chance that he definitely has fleas. 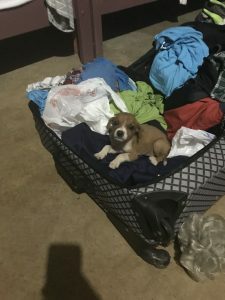 We came home from our daily adventure and we found Peanut (formerly known as “suitcase in Spanish”) in his suitcase. Today’s adventure started off with a 5:30 wake up call… yikes. 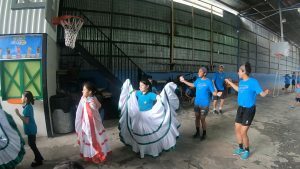 We headed out after our breakfast to Los Chiles where we hung out and played sports with kids of all ages. Side note: we got to drive past a volcano and trying to use the nearest bathroom with a cat looking at you was quite an experience. Back to business, although it was controlled chaos at moments playing with the kids, it was a blast. After what felt like three hours of playing, which was in reality more like one or two, we enjoyed a lovely lunch. From there we really got to the meat of our day: our first water filter demonstrations. 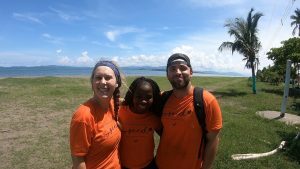 The trip revolves around our love for God, sports, and bringing clean water. Nick, Mason, and Luke led the water demonstration. 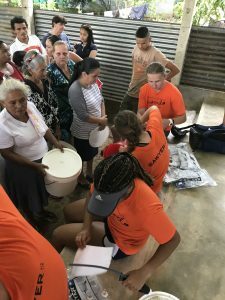 When it came time to show how amazing the Sawyer filters are, the three all took sips from the newly filtered water—the crowd began to applaud. It was very powerful and amazing to see the peoples’ reactions. As a result, five people in the crowd committed their lives to God. In total, about 80 filters were distributed to the people. After that excitement, we enjoyed a nice cinnamon roll break before making the two hour bus ride back to Platanar. 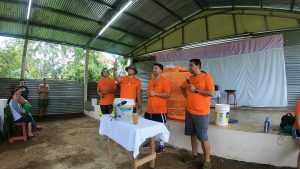 Nick, Luke, and Mason demonstrate the water filters while Carlos translates. 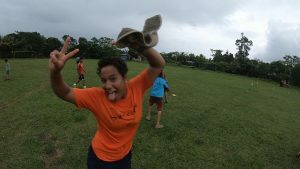 Noelle having fun with the kids. Today was our first day of sports clinics. Our day started bright and early at 6:20 with a wake up call followed by breakfast at 6:50. If I might say so myself the mangoes at breakfast were the bomb. We headed out for a school in San Jose at 7:45. When we arrived after the 40 minute bus ride, we set up two stations in the outdoor gym. 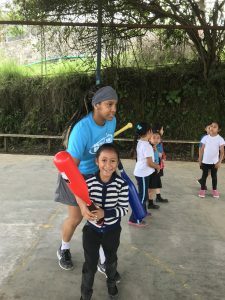 The two sports we focused on teaching the 1st and 2nd graders were baseball and American football. 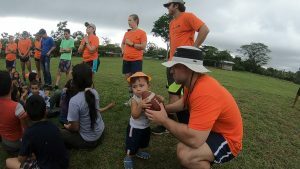 The football stations taught them how to throw the ball, while the baseball station played a mini game of baseball. The kids were energetic and all over the place but very loving. 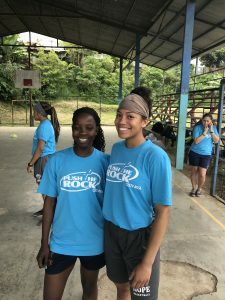 They were happy to learn sports they haven’t played before. 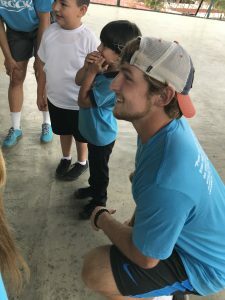 We spent a little bit over an hour with each grade, and Nick, Noelle, Mitchel, and Mason aka Messi, as they called him, were able to share their stories with the kids. After our time was up we headed back to AMCA for lunch before leaving for Platanar. We had a long 3 hour bus ride through the mountains as high as the clouds. The bus ride was as bumpy and winding as a roller coaster. We finally arrived to the place where we were staying, we walked to a nearby river skipped some rocks, caught some tadpoles and got really muddy. Then played some golf—the card game that is— before dinner and ended the night with a nice meal and devotional time. Hopefully we don’t get rabies or fleas from the stray dog Mason and Luke petted. Nicole’s fan club reading the Bible verse on the back of her shirt. We have been in Costa RIca for 8 hours now and I would say we are tired. Our day started at 2:00 am when we departed from Hope College for Midway airport. Our flight was scheduled for 5:00 am. 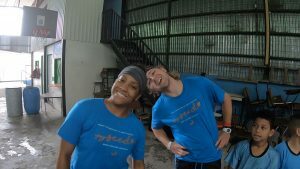 We had an hour layover in FortLauderdale,Florida and then had a three hour flight to San Jose,Costa Rica. We landed in Costa Rica at around noon. We were picked up from the airport by a mini bus and our driver’s name was Christian. 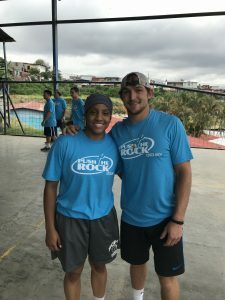 Christian works a lot with Push the Rock, which is a sports ministry organization that we are partnering with while we are in Costa Rica. Our Ride to AMCA (hostel we are staying in) took about 45 minutes.The ride home was very picturesque with beautiful mountains by the road side. We had a nice taco dinner tonight followed by some awesome team bonding and even more amazing testimonies. We can’t wait to see what tomorrow brings!